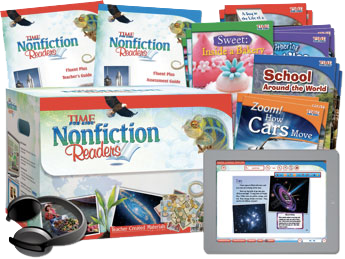 These dynamic and engaging nonfiction readers are the perfect supplement your literacy school bookroom or classroom library. Address individual abilities with trios of levelled books. Save time with the Teacher’s Guides and the menu of lesson ideas for word study, vocabulary, comprehension, and fluency. Track progress through placement tests and assessments in the Assessment Guide. Encourage Home-School Connections by sharing the Parent Tips Booklet to help students continue building literacy skills at home. Offer a blended learning experience with Interactiv-eBooks. Give students a model of fluent reading with Audio Recordings of each book. The following levels are available. Click on the title to review a sampler. A list of titles in the kit is provided in the sampler.